Fourth Grade Nothing: Nickelodeon's Out of Control - Cut it Out! Nickelodeon's Out of Control - Cut it Out! Nickelodeon's Out of Control stared Dave Coulier. Before we knew him as Joey Gladstone from the 1987 hit family sitcom Full House and as the subject of fellow '80s Nickelodeon star, Alanis Morissette's "You Oughta Know" song in 1995, Dave Coulier hosted a kid's "late night" or news-style sketch comedy show on Nickelodeon called Out of Control. 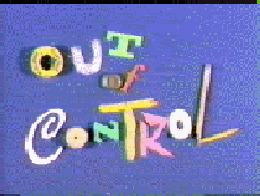 Out of Control was recorded between 1983-1984 and originally aired between October, 1984 and May, 1985. The kid's show featured a cast of zany regulars such as Diz Aster (Diz McNally) and Angela "Scoop" Quickly (Jill Wakewood) with the occasional special guest such as The Incredible Hulk's Bill Bixby. I don't remember much about this show other than Dave Coulier acting wacky and always including his "Cut it -- OUT" catch phrase in every episode. Obviously he later brought "CUT IT -- OUT" to Full House. Watch this episode of Out of Control to refresh your memory. Totally missed out on this one. Wonder why? I remember this show, and You Can't Do That On Television. Both priceless shows. Betty, maybe because you weren't 12 in 1984. When I pressed post comment, the first time, it took me to where you type a new post, or something similar? Freaky! I remember "Cut it out!" but not the show. [Did he say that on Full House too?] It looks like a fun show. Guess I missed out. Did you see that Nickelodeon is now broadcasting their old programming from the 90's after midnight on Teen Nick? I wanna see them do this with the 80's shows like The third eye! Of course.. kids today probably wouldn't be interested in 80's programming. Maybe they need to create a "Midlife Nick" Channel? A lot of Nickelodeon under the bridge after all these years. Aside from only lasting a season, Nick would repeat Out of Control every so often up to the early 90's. This and a clip montage program called "Turkey Television" were rather unique highlights of Nickelodeon's revamped image in '84 from the "silver ball", National Education Association-endorsed network it started out as. You really had to be one of the appreciated few in the 1980's to have had cable TV in your area, let alone in your house to have seen any of this. Maybe they need to create a "Midlife Nick" Channel? Assuming most of us can still ask for such a channel. I've put up a few episodes I had on tape on YouTube as well you guys can go search for too. This was one wacky show and funny. I always enjoyed the "How not to do things." Like how to kiss. Often at times, Dave took field trips to a candy factory to see how the made chocolate, and he also hosted the segment "hurry up." as kids most boring time was done in fast motion like grocery shopping. It was funny to see Hern Berferd taking lessongs from Ha Ha the studio's computer on how to work a computer "How not to do things." It was also funny with clips like a girl takes in a homeless kitty and her house is full of cats. Lastly it was funny when Dave's animated character came into the scene and said "That's Stupid." Diz was one zany dressed up character always into fashion. One last clip I remembered was when they went to Arkansas to a place where aniamls showcase their talent like playing musical instruments, playing basebell, and dancing. They even had a few Mccaws showcasing their talents and such. I Wrote a Justin Bieber Book! NBC's That's One To Grow On!